The secret is in the Apple! 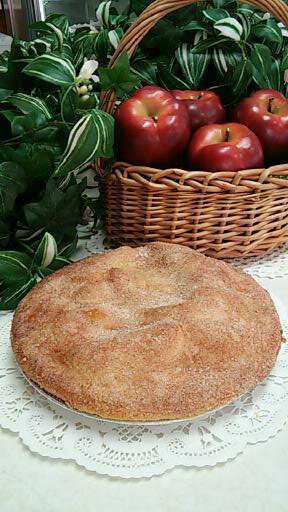 For our Old-Fashion Baked Apple pie, a firmer apple such as the Granny Smith or a "green apple" must be used. The apples are peeled and immediately sliced fresh. Tossed with a generous portion of cinnamon sugar and buttery shortening, they are laid into a pie dough shell. Now though the pie dough is often overlooked, it is the element that holds all things together. Too thick, and a doughy bottom prevails. Too thin and the crust will not hold up to the weight of the apples. You need a perfect dough on bottom and top for this pie. As the fresh apples bake, they produce a beautiful natural liquid of flavor that combines with the melting cinnamon sugar and shortening. It is in the oven where the "filling" for this pie is made. Some people ask how our regular apple pie differs and it's easiest to point to the inside. For a regular apple pie, we cook a top a stove our recipe of apples and spices to make a prepared fruit filling. For the Old-Fashion green apple pie, the "filling" is not cooked but Baked right inside the pie itself. From the outside you can identify this pie by the cinnamon sugar on top. From the taste you can identify this pie, as it will taste like the one your grandmother made. Most importantly, it is by the proper Apple that this pie can be identified. A green apple, a firmer apple will bake and soften without turning to "applesauce" in the oven. The green apple, a slightly tarter apple, will mix with the cinnamon sugar to produce the perfect amount of sweetness. Yes, the secret is in the apple... but the knowledge and skilled hands of our bakers leads to a perfect pie every time, which is no small feat for the Green Apple Pie!